Forewarning sign at the long-abandoned Hockley County Jail. Sitting on the southeast corner of the Hockley County Courthouse Square is a rather nondescript two-story white building built in 1938 as a jail. The lower northeast section was reserved for living quarters for the county sheriff. The second floor housed an odd number of 13 jail cells. Cooking for the prisoners fell upon the sheriff’s wife who apparently lived in the jail as well. 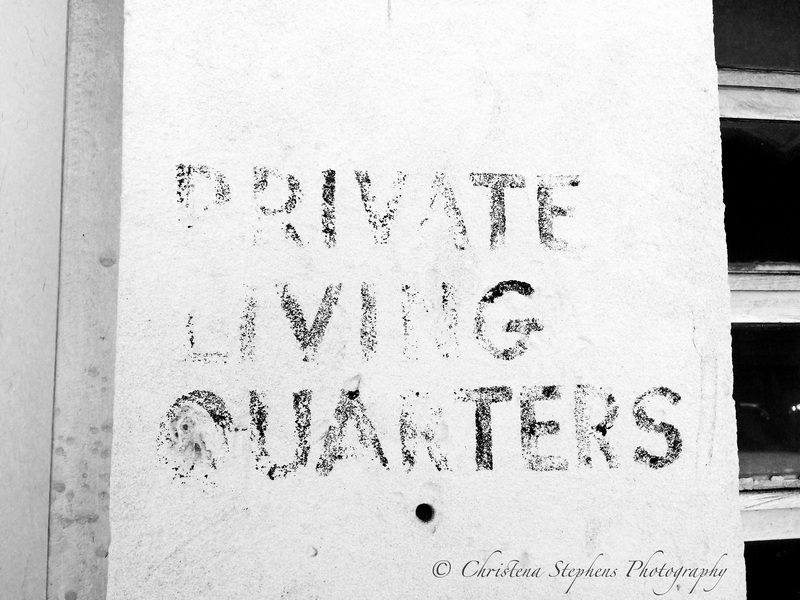 Faded Private Living Quarters sign. The first sheriff to move into the building was Ed Hofacket. Elected as sheriff in 1936 he had over 700 arrests within the first few years and never had to use a gun. 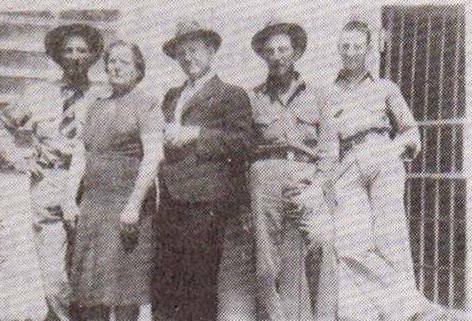 Ed Hofacket is third from the right standing at an unknown location of the jailhouse in 1938. Picture courtesy of Find-a-Grave. 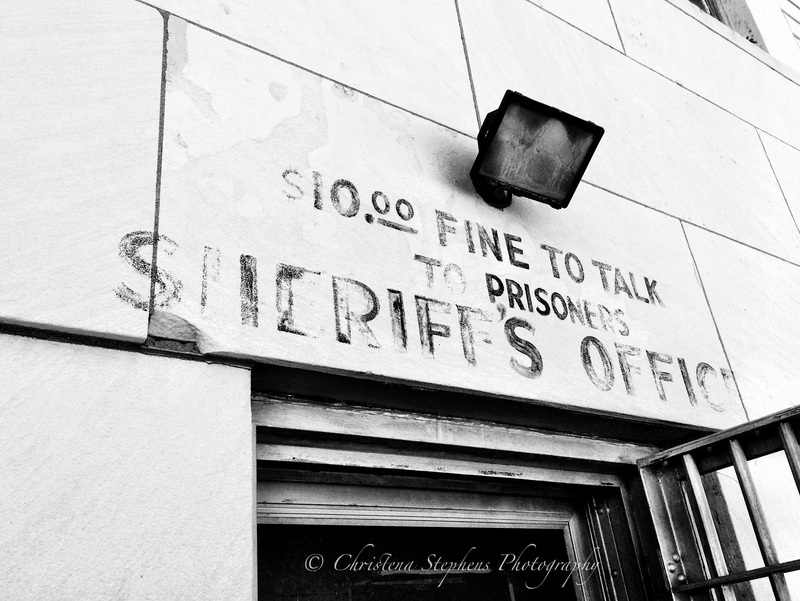 Above the north jail entrance, a faded eerie forewarning remains: “$10 fine to talk to prisoners.” Information on where this originated or why it was in place has not been found yet. The current courthouse constructed in 1928 has three prominent floors. What most people don’t know is that a narrow spiral staircase leads to a fourth floor that was used as a county jail before the 1938 structure was built. Long abandoned for over 30 years after the new jail was built its now used for various storage items, especially old files. enjoyed your pictures of the Hockley County jail, in the picture is Vernon, Ed,s oldest son, Ed, Heatha,my dad Woodrow then Rusty, some of the inmates would turn themselves in on Saturday night to sleep it off and eat my grandmother s cooking. He did stop two bank robberies and quell one riot. Thanks so much for the wonderful caption information. 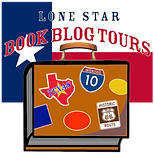 You don’t think bank robberies or riot’s could have occurred in this part of Texas. I’m glad you stopped by. Don’t know if you want confirmation, but you are correct. Ed Hofacket is my grandfather and my dad (on the far right in your group picture) was 11 when he moved to the jail. The grandma Heatha was the cook (a great cook, too) and my dad grew up on prison food. Also correct, although Ed carried a gun, he never need to use it. THANKS FOR THIS MEMORY. Wonderful. Blessings to you. Thank you so much for commenting and sharing your family history. Blessing to you! I like how you blend your photography with your writing. It’s a very nice touch. Do the photographs prompt the story, or do the stories prompt the photographs? Just curious. Thank you! Actually, its a bit of both aspects and goes back to me being an accidental historian. Some of my photographs don’t need words only really good titles, but more often the photograph means nothing without a story behind it.